My perfect Saturday always includes brunch. I want to sleep in, then wake up and laze about the house sipping coffee, maybe run to the farmers market for some greens and bread, and then come home for a hearty late-morning/early-afternoon meal. 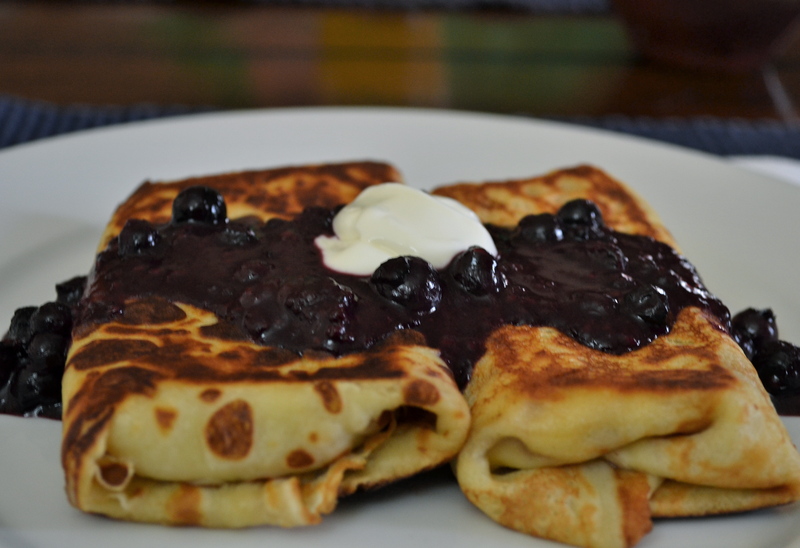 Blintzes are one of my favorite brunch meals. We enjoyed these ricotta stuffed crepes covered in blueberry sauce last weekend, and if I were home this weekend I would make them again. Alas, I have the hardship of spending the weekend at a beautiful monastery in the Hudson Valley, where I have been an intern since last year. When I am not leading retreat sessions or talking with people about their spirituality, I am usually downstairs hanging out with the chefs, talking about food and ooh-ing and aah-ing over the delicacies that come out of the kitchen for our three common meals. A religious community with gourmet chefs on staff–It’s not a surprise I ended up here. So, I’ll miss my brunch this Saturday, but I won’t have to cook for or clean up after anyone and I get to eat out of a gourmet kitchen all weekend long, so I’m not complaining. The following recipe will serve 4 hungry brunchers just back from the farmers market who have a whole lot of house to clean and laundry to fold. 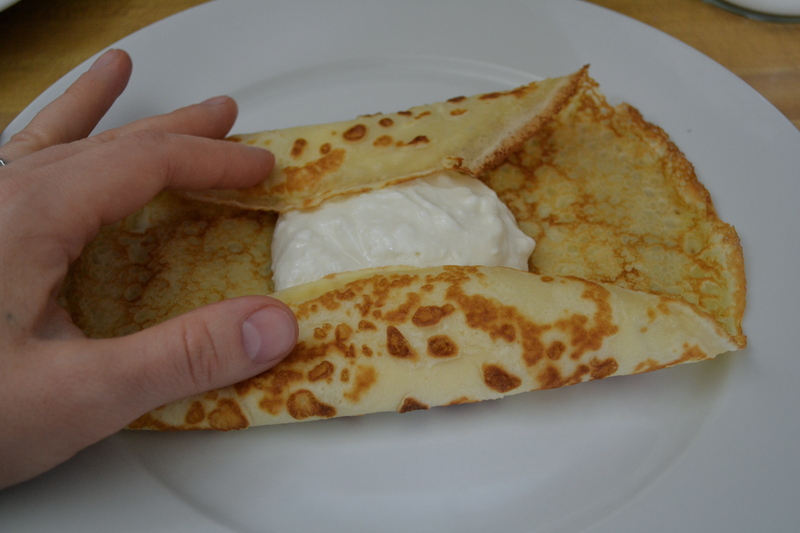 There are several steps to making blintz, starting with making the crepes, then filling and cooking them. When I know that I’m going to be making blintzes, I try to make the crepes up a day ahead of time and refrigerate them until I’m ready to fill them, otherwise this can take a while. Heat a medium saute pan over medium-high heat. Have on hand cooking spray or oil and a brush for spreading on the crepe pan. In a medium bowl, beat the egg. Add the milk, sugar, oil and sifted flour and beat until well combined. Some people do this all in a blender, but I don’t like cleaning my blender, so I tend not to use it. When the pan is hot, brush it with cooking oil or spray it with cooking spray. I prefer the oil to the spray for this because I tend to burn the spray. Pour enough batter into the pan that when you tilt the pan around to disperse the batter, the batter just covers the entire pan. There should be just enough batter to cover the pan without extra batter pooling anywhere. I always consider the first crepe a practice run where I usually put too much in the pan. 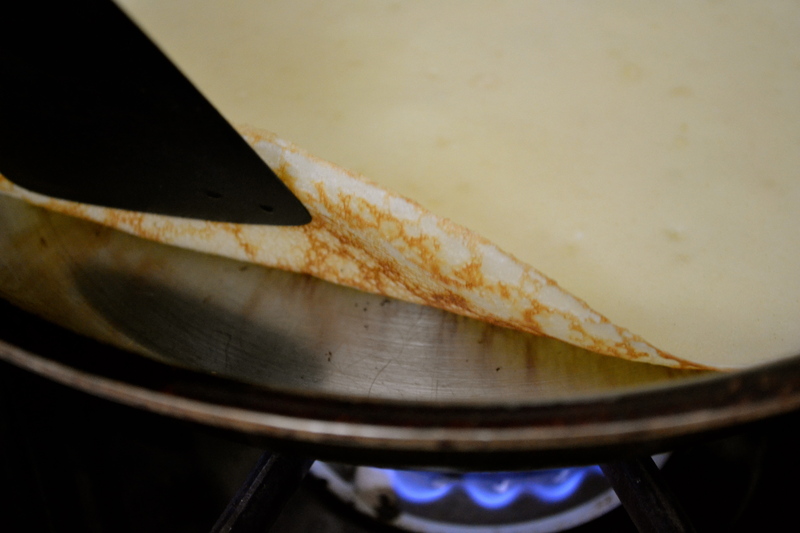 When the edges of the crepe start to brown and curl in, check to see if the bottom of the crepe is browned by lifting up the edge with a spatuala. 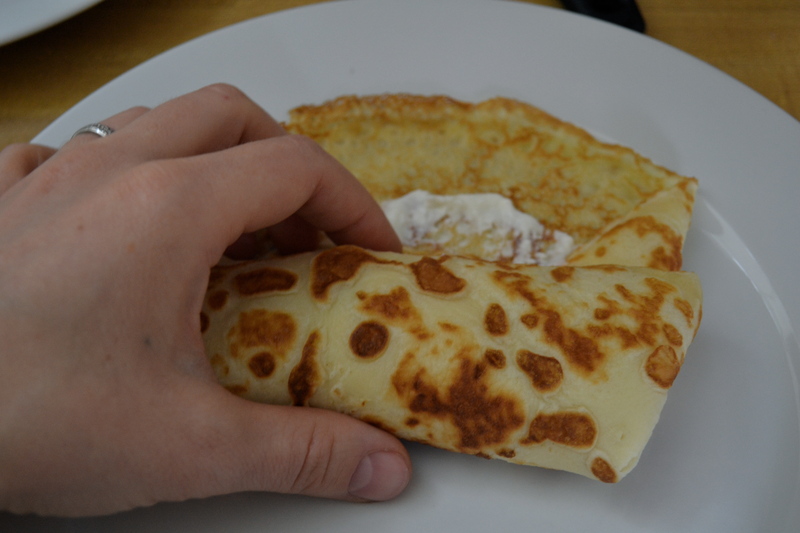 When the crepe looks like the above, usually after 2 minutes or so, turn it and let it cook another 30 – 60 seconds before removing from the heat. Re-oil your pan and repeat until all the batter is gone. Place the cooked crepes on a plate and let cool. They don’t usually stick together, so I don’t but anything between my crepes. If you are not using them right away, cover them with plastic wrap and put in the fridge. They will keep for 2 days. Let them come to room temperature before you use them, or briefly microwave them so they don’t crack when you roll them up with filling. 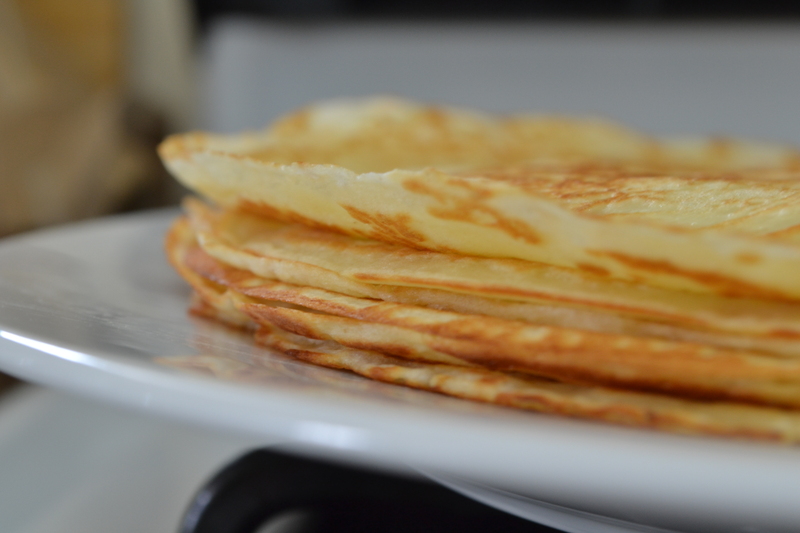 If you don’t want to make filling, crepes are perfect spread with butter and sprinkled with powdered sugar. To make the filling, mix the ricotta, cottage cheese, and 2 tablespoons of honey together in a small bowl and set aside. Add more honey to taste. To make the blueberry sauce, place the blueberries, lemon juice, and sugar or honey in a medium saucepan. Cook over medium heat until the blueberries are entirely defrosted and they have released their juices, stirring occasionally, which takes about 5 minutes. When the blueberry mixture is boiling, stir in the sifted flour or arrowroot powder. Turn the heat down so the berries are simmering, and cook for a few more minutes, until the mixture is slightly thickened and the floury taste has cooked out. Taste for sweetness and add more sugar or honey to suit your preferences. I don’t like mine syrupy sweet, so I do not add more sweetener to mine. Turn the heat off, or on low until ready to serve over the crepes. Stir together and reheat if necessary before serving. Preheat an your oven to 400°. 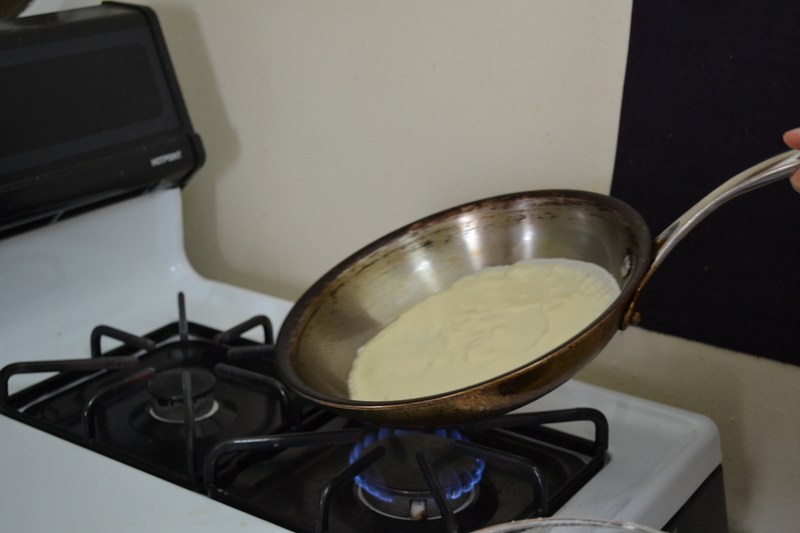 With a crepe in front of you on a work surface, spoon about 1/4 cup of filling into the center of the crepe. You are going to roll these up kind of like a burrito, folding in the sides first, then bringing one of the unfolded edges over the filling and rolling over so the seam is now under the folded-up blintz. When all of your crepes have been filled, heat a large, oven proof saute pan over medium-high on the stove. 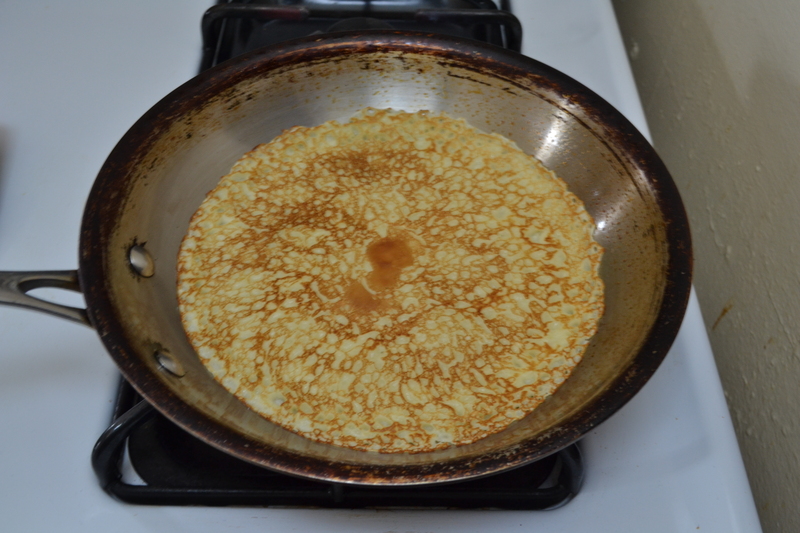 Melt a tablespoon or so of butter in the pan and then add your filled crepes, seam side down. If they do not all fit, you will have to do them in batches and then transfer them to a large casserole dish or baking sheet for finishing in the oven. When the bottoms of the blintzes have crisped up a bit, remove the whole pan from the stove and place it, uncovered, in the oven for 8 – 10 minutes, which heats them all the way through and sets up the cheese a bit. Alternatively, after crisping the bottoms of them, place them in the large casserole and place the casserole in the oven. When they are thoroughly warmed, remove them from the oven and place two blintzes on each plate. Serve with the blueberry sauce poured over the tops. We like to put a dollop of sour cream or whipped cream on top of the berry mix. Serve hot.